legendary. He publicly admits to steroid and marijuana use. Watch this section for recent news and important articles. For more background information on Arnold, visit our Arnold section or check out our articles page. 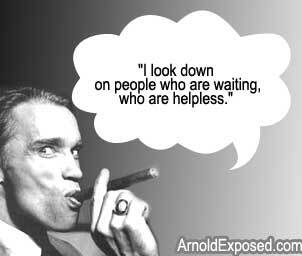 Alex Jones and everyone at Americans Against Arnold would like to thank everyone that submitted a video or audio PSA. Everyone who entered is a winner for getting in the arena and taking action. It wasn't easy to choose just one from each category among all of the fantastic submissions but we have and the winning entries are posted here. We will be posting some of our other favorite entries in the coming weeks, so check back often. ""I thought I was the only one that was listening.....I am just one little old lady in Fl that gets sick at the thought of changing the Constitution....and especially to suit Arnold...What are people thinking? ..."